Dessert/Cooking Apple James Grieve fruit trees - Raised by James Grieve in Edinburgh, Scotland. First recorded in 1893. Received the Award of Merit from the Royal Horticultural Society in 1897. Now a well known well flavoured, juicy second early. An excellent choice, especially for a difficult site. Crops heavily and regularly. The soft texture fruit is both juicy and tangy. Does well in northern gardens. Picking time late August to early September. Pollination group 3. 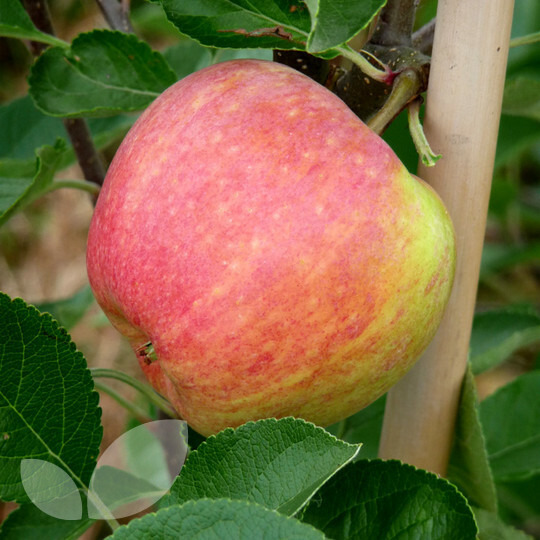 This is a very reliable variety, the most consistent cropper among all apples in our London garden. We ordered the cordon bare root option last year to replace a diseased tree. Upon arrival it looked well pruned into shape. Within a month of arrival in March it flowered. Much as expected of a James Grieve! Excited to eat those delicious apples again this year (we removed flowers last year as have just planted it then). Excellent apples trees. I was so pleased with my James Grieve on M27. Bought bare rooted and planted in a pot earlier in the year, it survived the harsh winter and dry summer. I have been buying fruit trees from Blackmoor since 2013. I have an older James Grieve, also from Blackmoor. It fruits well. Very happy, prompt delivery and healthy bare root tree. looking forward to spring. Purchased a James Grieve Apple tree, a healthy bare root tree was promptly delivered. Very impressed with the service and quality of the tree supplied. Thanks for the excellent service and delivery of the fruit trees. They were very well packed and look to be of a high quality and in excellent condition. Also thanks for the quick email response to my questions prior to my order. Prompt delivery of healthy looking bare rooted tree on M27. First class specimen to train as a stepover. Thanks. Tree arrived looking very healthy, M27 rootstock, well packaged and delivered quickly after ordering. Can't fault the service from Blackmoor's or the tree. Well packaged and a healthy looking tree. Planted earlier this year and the tree is doing very well. Would happily recommend. I was kept informed about progress of my order. My trees (James Grieve and Cox's OP, 1 year old bare root) look very good - nice shape and healthy. Well packaged. Excellent healthy tree delivered speedily and very well packaged. Superb service as usual. Beautiful, healthy tree. Also bought a Katy apple tree and I am delighted with both. Thank you Blackmoor. Another fantastic tree, very well packaged, fast delivery can't fault your service thank you very much. Excellent quality tree delivered, well packaged as usual. Tree has established very well and I am training as a dwarf pyramid. Managed a couple of delicious fruit even in first year! M27 rootstock, excellent healthy tree, provided us with 7 large eating apples of very good flavour in first full season.